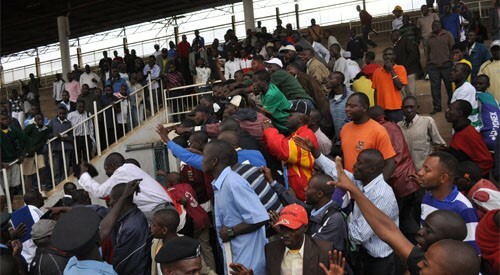 Peter Thiong’o, Cameroonian Mxwell Ravel and George Mandela were on target as Kakamega Homeboyz thrashed AFC Leopards 3-0 in a Kenyan Premier League tie at the Bukhungu Stadium in Kakamega. Still without their absentee head coach Nikola Kavazovic, AFC were looking for their first win of the season after playing to a 1-1 draw with Kariobangi Sharks last weekend, but they were stopped right on their tracks. Homeboyz, playing at home but with almost less of the 12th man advantage compared to AFC who were home away from home broke the deadlock on the quarter hour mark. Thiong’o played behind the defense to face Jairus Adira and he made no mistake taking his side into the lead. Former AFC keeper Gabriel Andika now guarding Homeboyz’s goal was a quiet man all afternoon up until the 40th minute when he was called up to rise and tip over a well taken freekick from Robinson Kamura. Andika was beaten two minutes later with a Brian Marita shot, but good for him the ball was cleared off the line by a covering defender. At the start of the second half, Homeboyz boss Paul Nkata introduced Allan Wanga to come up against his former employers as he sought to add some spice into attack. Homeboyz kept their pressure and after 68 minutes it was 2-0 when Thiong’o pulled Ravel through, the burly Cameroonian doing the rest of the job to beat Adira for is second goal in as many matches for his new employers. Thiong’o, easily man of the match with his performance upfront for Homeboyz was the creator of the third goal, this time teeing up Mandela to finish off the job with an easy tap in. In the early kick off, Mathare United produced a similar 3-0 result against Nzoia Sugar with goals from Cliff Nyakeya, defender Andrew Juma and Chris Oduor. Nzoia had to finish the game with 10 men after Collins Wakhungu was sent off after 23 minutes for a rush tackle on James Kinyanjui.